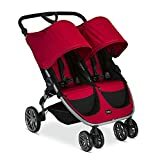 What are the best Double Stroller Travel Systems? It is difficult to lug around the needs and essentials of one baby, much more two! 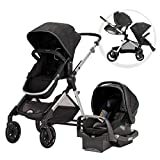 Parents who need to care for two children, either twins or toddlers, need not only a good double stroller but also a travel system that would ease the burden of taking the kids out for a day of shopping, groceries, walk to the park, and other errands. Just imagine if you are a mom or a dad going out alone with two kids without a handy double stroller travel system! You won’t be able to focus on the tasks at hand because all your attention would be on the kids. A good travel system is definitely what all parents need so that they can have some quality time with the kids while being able to cover as much area as possible (if touring) and get things done. There are a lot of double stroller travel systems available and it might be a bit overwhelming when you are searching for the first time. In this article, you will find some noteworthy brands to check out. Hopefully, it will give you an idea on what you need, how much the price range is, and the brands other parents are raving about. What are the best-rated double stroller travel systems? This travel system comes with two back to back seats propped up on a stroller and two separate car seats. 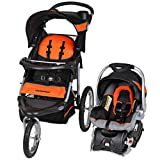 This is a good pick if you are looking for a stroller and travel system duo that can still be used even after the children has outgrown the baby car seats. The stroller seats can be adjusted so that they can still cater to the growing needs of the children. It features over 12 riding options from infancy to youth. The front seat is a bit different than the back seat because it is much bigger and wider, and has footrest. The front seat can hold the weight of a child up to 50 pounds. It is multi-positional so that infants can lie flat on their backs. The backseat, on the other hand, suits infants perfectly as it resembles the design of the accompanying car seats. This seat is intended for infants weighing 5 – 22 pounds. All seats feature a five-point harness so you can be sure that your children are secured no matter how rocky the roads are. This double stroller features stadium style seats. This is great for twins or for children who are close the same age as the other. It is also good if you have an older child because the rear seat is much bigger and wider, and it can actually removed so that the child can be in a standing position. This travel system only comes with one car seat, so you have to purchase another car seat if needed. The double stroller features safety straps to hold the children in place while you walk around. The seats can also be reclined, which is good for infants. Both the seats in the stroller feature a molded tray and cup holder. For the parents’ ease, there’s also a cup holder and a basket underneath to contain the essentials of your kids. The seats can hold the weight of children between 5 – 30 pounds. A pair of double wheels in front and a pair of single rear wheels hold the stroller. This double stroller travel system includes a twin stroller with side-by-side seats, one car seat, and a diaper bag. You may be required to buy another car seat of the same brand if you want your travel system to match. The double stroller features an infinite recline, which is good for infants, and has safety harnesses to hold the children in place. The stroller only measures 30.5 inches wide so that you can go through standard-sized doorways with ease. The handles are adjustable to suit the height of the parent. The car seat can hold up to 30 pounds weight. It has safety harnesses and base so you can quickly install it into your car. 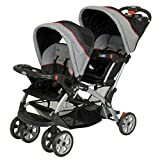 MULTIPURPOSE DOUBLE STROLLER: The Evenflo Pivot Xpand Modular Travel System is a parent-friendly single-to-double stroller designed with a unique slide-and-lock system that expands the frame to accommodate a second toddler or infant seat. 22 STROLLER CONFIGURATIONS: Our lightweight stroller allows babies and infants to sit at various heights, reclined or upright, and in parent-facing mode. Altogether, this baby stroller offers 22 unique configurations.Machine wash the seat pad separately in cold water, delicate cycle. Tumble dry 10 to 15 minutes on low heat. MULTIPLE HANDY FEATURES: The Pivot Xpand is a complete baby travel system. The compact folding stroller conveniently self-stands with the toddler seat attached, while the extra-large storage basket expands to over 2 feet with front and back access. This double stroller travel system is one of the best quality ones out there. However, the quality and build may not be enough to justify the expensive price of this travel system. For those who can shell out this much, this is a really good buy. The stroller is perfect for twins or for kids whose ages aren’t far apart. The two seats of the stroller are identical in design and size. It reclines just enough so that it can seat an infant with ease. Parents also don’t have to worry about the baby outgrowing the stroller because it can still be used for years to come. The stroller has a roomy basket underneath for essentials. The seats are positioned in stadium style. The travel system comes with two matching car seats and a baby bag. This entire travel system looks and feels very luxurious. This double stroller travel system is best for two children of different ages as one seat is meant for a toddler and another for an infant. The best thing about this stroller is that the seats can be lifted off the metal skeleton and transferred onto the car base. Parents who are looking for a stroller and car seat in one may find great relief after seeing this. You won’t have to carry and possibly wake the children when transferring them from the stroller onto the car seat. The aluminum frame is both strong and lightweight for faster transporting. 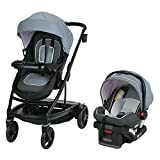 Whether you are looking for the best stroller travel system for twins or for different aged kids, you are greatly doing yourself a favor because of the ease travel systems can give you, especially if you like to go to places a lot.